The Shanghai Cooperation Organisation is the new Warsaw Pact-with money and oil. Grouping Russia, China and much of Central Asia into an economic and security alliance, SCO will become the West's greatest threat in years to come. Especially if they succeed in drawing India, Pakistan and Iran further into their orbit. 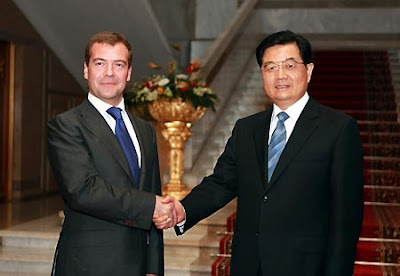 Chinese President Hu Jintao (R) meets with his Russian counterpart Dmitry Medvedev in Dushanbe, capital of Tajikistan, Aug. 27, 2008. The Chinese and Russian presidents are in Dushanbe for Thursday's Shanghai Cooperation Organization (SCO) summit. Chinese President Hu Jintao and his Russian counterpart Dmitry Medvedev met in the Tajik capital of Dushanbe Wednesday to discuss furthering bilateral relations. "I'm very glad to meet you again in just over a month," President Hu told Medvedev, whom he met on the sidelines of the outreach sessions of the Group of Eight Summit in Japan on July 9. Medvedev briefed Hu the issue of South Ossetia and Abkhazia, as well as Russia's stance. China has noticed the latest development in the region, expecting all sides concerned to properly settle the issue through dialogue and coordination, Hu said. On the Shanghai Cooperation Organization, Hu stressed that the SCO is embracing new opportunities and also confronted with challenges. He suggested that China and Russia work along with other SCO members to enhance coordination and push forward the cooperation in politics, trade, economy and security within the SCO. Russian-Chinese cooperation plays an important role in the development of Central Asia, Medevedev said, noting Russia will strengthen coordination and cooperation within the SCO in a bid tojointly preserve peace and stability in the region. On bilateral relations, Hu said the China-Russia partnership of strategic cooperation has maintained a sound momentum of development. Medvedev hailed the development of bilateral relations, saying to carry out substantial cooperation with China is an important direction in Russia's external cooperation. Hu and Medvedev are in Dushanbe for Thursday's Shanghai Cooperation Organization (SCO) summit, which will focus on economic, security and cultural cooperation in the region. Founded in Shanghai on June 15, 2001, the SCO groups China, Russia, Kazakhstan, Kyrgyzstan, Tajikistan and Uzbekistan. Mongolia, Pakistan, Iran and India are observers of the SCO. It appears that China is not backing Russia. Russia will probably keep control of Abkhazia and Ossettia but their invasion of Georgia is the biggest boost for NATO since the invasion of Czechoslovakia in 1968. NATO will counter by boosting defenses in the Baltic states which are vulnerable to Russian attack. Poland is not vulnerable to Russian conventional attack. If Russia attacks Poland they will be stunned and defeated by the Poles and NATO. The Ukraine is ground zero in Cold War II. I predict a swift and very controversial NATO membership for Ukraine. Cold War II was started when Russia crossed the Rubicon and invaded Georgia. Bush was wrong when he looked into Putin's eyes and claimed he is a man we can do business with. Trevor and McCain have been vindicated in their distrust of the "new" Russia. Thanks Reid. It was a damned hard call turning down that VP spot. 2/3rds of Ukrainians don't want Nato membership, nearly half of them sympathise with Russia to the point of wanting annexation, the pro-Russian opposition could take back power at any time, and their president is about as popular as Winston Peters.